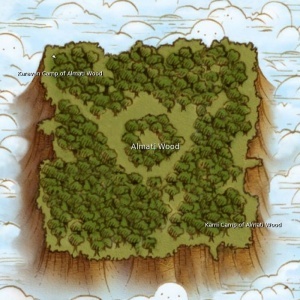 A map of Almati Wood. Almati Wood is a region of the Old Lands that were overrun by the Kitin during the Great Swarming. Named after Matisian botanist Almati. The region was opened up around November 2005 as part of the event to build the Karavan Temples and Kami Sanctuaries. Players were sent into various regions of the Old Lands to harvest the materials necessary for these constructions. Almati Wood was the third region to be opened up for this purpose, after Aelius Dunes and Olkern Lake. Unlike those two regions, which were closed after the harvesting was complete, Almati Wood remained open. It served little purpose for years, until the Kitins' Lair was opened in December 2009 in the middle of the region. Before the server merge that united all Homins on one shard in 2012, the only way to get to Almati Wood was to be teleported there by the Higher Powers. Those players whose Kami fame was higher than their Karavan fame would have to speak to a Kami Preacher at a Kami Sanctuary to be teleported. Those players whose Karavan fame was higher than their Kami fame would have to speak to a Karavan Teleporter at a Karavan Temple. Both a Kami Sanctuary and a Karavan Temple could be found in each of the capital city regions: Imperial Dunes, Majestic Garden, Liberty Lake and Cities of Intuition. In each region only one of the two was finished, but the unfinished one still had the person to teleport you. Depending on which Higher Power teleported you there, you'd end up either in the Karavan Camp or the Kami Camp, on opposite sides of the region: A remnant of when Kamist and Karavaneers fought eachother over the resources of Almati Wood. Currently, Almati Wood serves mainly as the route to the Kitins' Lair. Four of the new occupations also give out teleport pacts that teleport you directly to just outside the Rangers Camp. Both, the Karavan camp and the Kami camp still exists and from both camps there is a clear path to the Rangers Camp in the middle of the region, which houses the entrance to the Kitins' Lair. The rest of the region houses a variety of different Kitin of all difficulties, and little else of interest. This page was last edited on 15 February 2019, at 22:10.